Pastelon | There are a lot of dishes that make me think of home, but, there is no doubt that my favorite is Pastelon. It’s one of those dishes that I don’t get to enjoy often so when I do it’s a real treat. If you’re not familiar with pastelon, your life is incomplete. It’s basically a lasagna but, in my opinion, better in place of noodles you use sweet fried plantains. Some people may say that this is piñon and not pastelon. However, piñon typically will have a layer of canned green beans and the plantains maybe mashed. Over the years, I have come to realize that much like any country different regions have different preparations or names for similar dishes. Piñon is typically from the southern and west regions of Puerto Rico, and pastelon is from the east and northern regions. Why is pastelon so amazing? Because it’s the ultimate marriage of sweet and savory. The beef filling is simmered in an aromatic, savory tomato sauce. I like to add olives and raisins to my filling for surprise bombs of brine and sweet. The filling is layered with sweet fried plantains and stretchy delicious cheese. It’s probably one of the most amazing things you will ever eat. Just sayin’. Whenever I am introducing friends to Puerto Rican cuisine pastelon is one of my favorite recipes to prepare. I like to describe it as a Puerto Rican lasagna. And, who doesn’t like lasagna? But, it also introduces them to one of our most popular ingredients, plantains. I have yet to meet someone who hasn’t fallen in love with pastelon. The most important thing to pay attention to is the ripeness of your plantains. It’s important that the plantains be sufficiently ripe otherwise the pastelon will turn our dry and dry pastelon is “no bueno”. You want plantains that are really ripe. If you’re lucky you can find ripe plantains at your local Latin grocery or Asian market. If you don’t have either close by you can buy green plantains at almost any grocery store. Unfortunately, most local grocery stores will toss ripe plantains, which is very sad. On a few occasions, I have gotten the ripe plantains but just asking a store employee if they have any they are getting ready to discard. Depending on where you live will determine how long it takes a plantain to ripen. Warmer temperatures will ripen faster than cooler temperatures. During the winter months, I place mine in a paper bag and put them in the oven. Just make sure you remember they are there, and you don’t turn the oven on with the plantains in the oven. I have to warn you, it’s virtually impossible to have only one piece. You may try to implement some self-control but, you will you fail. I tell you this because I take no responsibility for enlargement of waistlines, the addition of dimples to the thigh and buttocks area or lectures from your cardiologist. Proceed at your own risk. Wondering what to serve with pastelon? I recommend a pot of arroz con gandules (rice and pigeon peas). If you’re not in the mood for rice, which is just crazy talk, maybe try some arepas de coco (coconut fry bread). And, no meal is complete without dessert! One of my favorite Puerto Rican desserts is tembleque (coconut pudding). 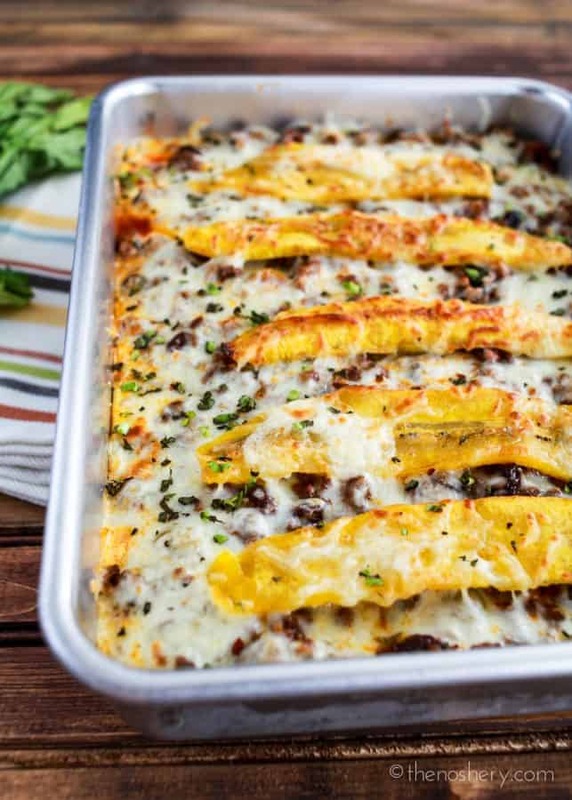 Sweet plantain strips fried and laid between layers of savory meat and cheese. Pastelon is one of my favorite dishes from childhood. Combine, beef, onion, pepper, garlic, cilantro, adobo, oregano, vinegar, and sazon. Mix well. Heat a large skillet over medium-high heat with 2 Tbs of olive oil, add meat mixture. Cook beef until brown and of the juices bubble up, add bay leaves, olives, raisins, and tomato sauce. Mix and let simmer for 10 minutes, set aside. I tried making this tonight. My husband and I live on Guam and on my last hospital stay in the PI, we tried some Puerto Rican food and husband was hooked. He was over joyed with this recipe. Thank you. I used a jalipano instead of green pepper (allergies), and it worked great! Thank you! By green pepper do you mean bell pepper or something spicier? I haven’t made this recipe in a couple months and can’t remember what I did last time! I made this recipe a few years ago and loved it so of course i pinned it onto my pinterest board but i remember the recipe used to have pictures of every step. Is this the same recipe? Did you just change the look of the page? It is the same recipe. I just updated the post. Hello I have a question. Can you prepare the pastelon, place in fridge over night then back in morning? When I googled “can I freeze unbaked pastelón” your recipe popped up with basically the same question highlighted under the link for your website. Anyway, I scrolled down through the comments above and could not find that question asked and answered here. I’m sure it is here, but I cannot find it. I apologize for asking again since you already answered it. Is it possible to freeze unbaked pastelón? My husband is from Naranjito, Puerto Rico and absolutely LOVES pastelón! (I do as well!) Your ingredients are exactly the same as I use. However, I omit the olives and raisins (to appease my husband’s taste buds). I appreciate your help with this, as there are many weeks between me making pastelón. We currently live in Austin, TX and although there are many Mexican supermarkets, finding Puerto Rican ingredients can be a bit difficult. We used to live in Philadelphia, PA and Puerto Rican supermarkets were everywhere along with ripe plantains! Here in Austin, it is mostly green plantains that I find. However, I learned something here today! I am so happy to find out that I can place the green plantains in a brown bag and place that bag in the oven to ripen them more quickly! I look forward to surfing through the rest of your website! Thanks for the tips on pastelón!! Yes! You can prepare it as usual and cover it to freeze before baking. When you are ready to cook it just put it in the oven frozen and covered with foil at 375 for about 1 hour. Once the pastelon is heated through (internal temp should be 165) uncover and bake another 10 minutes to let the cheese get bubbly. Recipe sound delicious! I cannot wait to make it. What does the egg on top do? Can I omit it? I saw someone above said that mozzarella wasn’t a good option, by my wife doesn’t eat swiss. How much cilantro? 1/2 cup? Hi! I would love to make this but I have two questions before I do. First, when you say “adobo” do you mean adobo seasoning, or like chipotle in adobo sauce? Second, what white cheese did you use? I mean adobo seasoning and you can use swiss or Monterey jack. I prefer Swiss. I was all prepared to make this recipe today & I bought GREEN plantains instead of ripe!why, oh why did I not read your post “How to peel plantains” first? I had to laugh as I later read the post with the plantain-under-the-nail cut warning. I am feeling that pain now! Ouch! Alright, now that know what NOT to do, I’m much more prepared for the next attempt at this recipe. Looks wonderful! With green plantains you can make some tostones! Or even tostone cups and fill them with anything of your preference . I like pico de gallo w/ gound meat but there’s other recipes that call for avacado and shrimp. I am looking to try this but am not a fan of Sazon. Do you know how I can duplicate this with spices instead? Sazon is very high in sodium . You can use garlic, pepper, onions, gren & red peppers, & pinch of salt to season the meat. I really hope you tucked a slice or two of this into your luggage for me. For those of you hesitant don’t be, I made this for my Puerto Rican husband and I am from Indiana and he loves it. I leave out the Raisins because my family is not a big fan of them with meat but leave everything else about the same, I maybe add a bit more sazon (1/2 packet) because that is how they like it. Thanks again for yet another family staple! I made this about 2 years ago and I still remember how good it was. The meat was so well seasoned and the raisins added a lot. I had some friends over for dinner who weren’ t very adventurous as far as food goes. I didn’t tell them it had plantains in it but they knew something was different. They said they really liked it so I confessed. I live in CO and it is hard to find ripe plantains or get them to ripen well. I will make this again someday when I have all day the next day to spend in the zumba studio! Yum. Hi! I am so glad I found your site! Just to clarify, and perhaps other bloggers can confirm, what you call “pastelón” is really a “piñon”. Pastelón is made with mashed plaintains as opposed to the sliced plantains. I think your right! I have always know this dish as pastelon and pinion is mashed, with green beans and a caramel coating. Like you do with flan. I was also born and raised in the island, metro area, and my experience is exactly as you describe it Marie. I’m glad I read this because a few months ago another puerto rican living now in the states like me told me that the mashed version was the pastelon and fried/sliced is pinon. But I’ve never even seen the mashed version. I have tried the pionono also. I wonder if it depends on where in the island you grew up.. I forgot which area of PR this other puerto rican I met here said she was from..
Not to devalue anyones family reference and experience but I think colloquially there might be some general confusion regarding these dishes. In the books: Cocine a Gusto by Berta Cabanillas (first published in 1950), and Puerto Rican Cookery by Carmen Aboy Valldejuli’s (first published in 1975), the sliced and fried plantain version is referred to as Piñón by both authors . 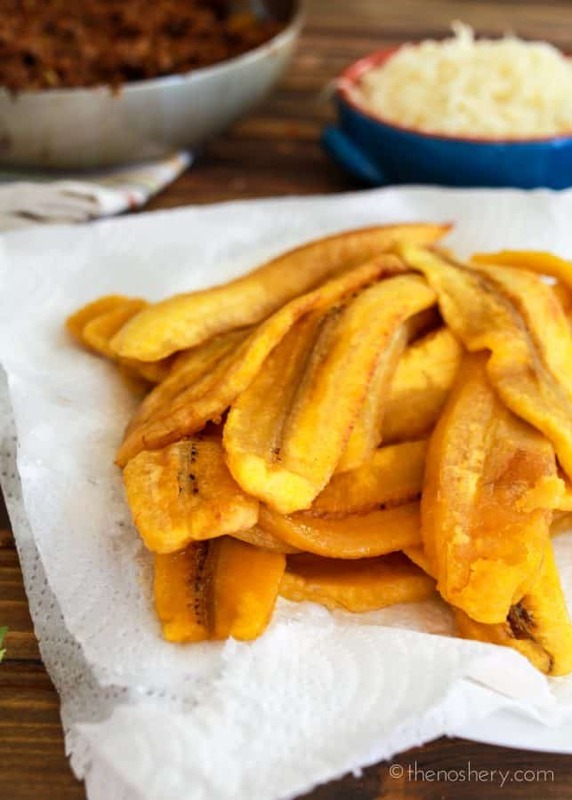 In Valldejuli’s Puerto Rican Cookery you can also find a recipe por “Pastelón de Plátanos Maduros” (page 122), where the plantains are first boiled then mashed with butter. This is the same procedure used when making Pastelón de Papas (the Caribbean version of shepherds pie), or when making “Pastelón” con cualquier otra vianda. Makes sense right! So sorry. How many layers of plantains you have? Plantain, Beef, Cheese, Plantain, Beef, Cheese and then the egg mixture? Based on some other comments I seem to see, I may myself mix the eggs and milk with the cheese rather than pouring the egg/milk. Thanks! OMG! I made this last night and it was amazing! I added sofrito as opposed to chopping up everything separately because well that’s how my mami made it. Thanks for reminding me of this mouth watering recipe! Oh man, this recipe brings back memories from long ago! I haven’t made this in a long time and this is definitely a sign! Great recipe, thanks! Mmm drooling just thinking about this! Question: usually I make my tomato sauce very Italian based (oregano, basil etc), is that too much? Should I use more mild plain crushed tomatoes? Just not sure how those flavors would work together. Thanks! Thank you so much for this recipe!! Mil gracias!!! La he buscado y hay muchas versiones, pero esta es la que me lleva a mi niñez con mis tios. Was looking for a one-meal-dish recipe for a pot-luck super at church and came across this item. It reminded me of a dish my mom made, which I haven’t had in quite some time. I am a transplant from Mayaguez, PR and raised in NYC. My mom called her recipe Pin~on, as is traditionally known in my part of the island. Before retiring from teaching, I worked in both Spanish Harlem and the Washington Heights/Inwood sections of Upper Manhattan. Interesting how in El Barrio it was referred to as Pin~on while in the Heights they called it Pastelon. How were they different? 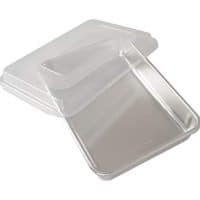 Pin~on, also known as the PR Lasagna, was layered just with the fried plantains, meat mixture and french style string beans, then doused with the egg ‘bath’; it was made in a round spring-form pan or mold. It had no cheese or raisins in the meat. The Pastelon of the Heights was closer to your recipe except some included sliced hard boiled eggs in the layering. I love this recipe. I would much rather have this than traditional lasagna. I love the raisins in the recipe. On my trip to PR several years ago I tried pastelon for the first time, and I could NOT stop thinking about it. As soon as I got home I googled it and found this. It is SO amazing and it has made it into my regular dinner recipe rotation. It does take some time to prepare but it is worth it. I make it with three layers of plantains (it gives it a nice stacked look) and omit the olives. Thank you for sharing this! Delicioso! I am so happy for this recipe because I couldn’t not find it anywhere else. I have made this a couple times and its great. I have also cheated and used the frozen goya plantains being a lazy. I never commented saying thank you for all of your recipes because I have made more that a few and I will continue to make them so thanks in advance. homemade sofrito instead of using all the vegetables to season the carne molida. This recipe is delicious. I tried with pulled pork instead of ground beef and it was great! It was like being home again. 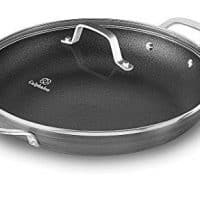 My husband is from US, he had never tried anything like that and he absolutely love it! he wants it all the time. Sorry honey, that’s a lot of work! This was delicious! My family loved it when I made it. I loved the olives in it and thank you for the great pictures and simple directions! Really nice job on this site!!! 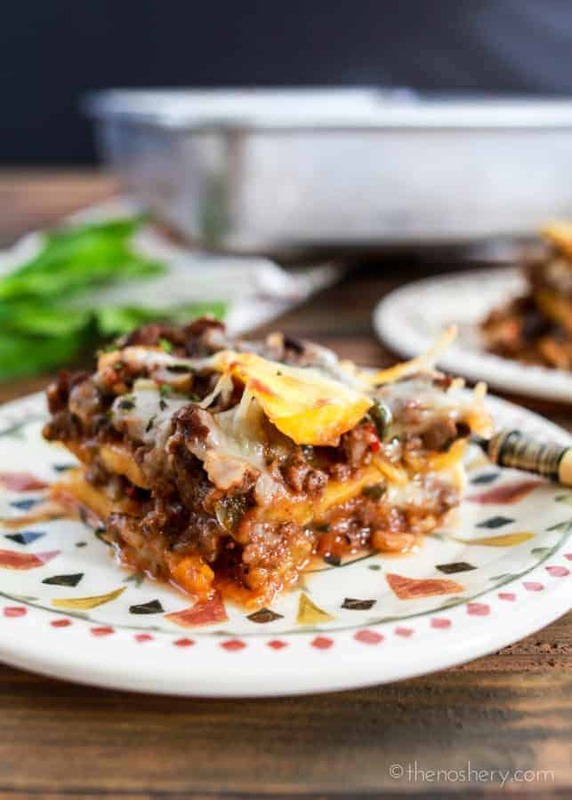 I make a mean Puerto Rican Lasagna, however, I’m going to try adding the vinegar and cilantro to the meat and milk to the egg…never thought about Monterrey Jack….I’m definitely going to try it your way. This is my go to pastelon recipe! I love it. I’ve made it numerous times using beef and substituting ground turkey too. Delicious. Thank you for posting. I’ve shared this recipe with friends and they love it too. Soooo good and a great change to the same old dishes. my mom makes this & its a famiky fav! she doesn’t use raisens, bay leaves, oregano, peppers or butter. she does add french style string beans as she layers. also, the liquid from the meat to coat the bottom of the pan is better than butter. she plans on making this soon & I’m going to videotape her (she’s 70 & is the best cook in the family)…. I just made this… i followed all the steps but skipped the green pepper, the tomato sauce and the olives because i didnt have any… and used one egg instead of 3… it came oout delicious… im in love with this dish. Made this tonight – love it!! Thank you for this recipe! I made it last night (only without the adobo seasoning . . . managed to find Sazon, but no adobo!) and the taste is absolutely delicious- love the little bursts of sweet and briny with the raisins and olives. The only thing that was “off” for me was the texture- I have a feeling my plantains weren’t ripe (I haven’t cooked with them before), so they were still a little firmer than expected (even after being fried in oil and baked in the casserole) and a bit dry. (Either that, or they weren’t sliced thin enough? Not sure- I got about 4 or 5 slices per plantain). Will have to try again with some plantains that I know for sure are ripe and see if that changes it up. when cooking w plantains they have to be ripe & cut thin. I would say cut it in half & then lengthwise & u should get 5/6 slices. Sounds to me as if your plantains were not the yellow, ripened type, known as maduros (ripe). The texture will be off if you use the green plantain that is still green, even with a slight yellowish tint to them. Most bodegas or Spanish fruit/veg stand can tell you which platanos are verde (green) or maduros. To Cand86 you sliced them way to thick. Try to make the slices 1/8 of an inch thick. I’m going to make this recipe tonight hopefully my husband loves it. OMG! I just tried your recipe and it is DELICIOUS! Thanks for sharing! Made this tonight. It was delicious and the recipe was very easy to follow. Thank you! I’ve never had this dish before, but my boyfriend rants and raves about it and says it’s his favorite dish. So I’ve decided to make it for him using your recipe! I love the pictures and clear instructions! Do you serve this with a side like rice and if so have you posted a recipe for it? Thanks! I’m excited to try this and surprise him. Oh man, I am not Puerto Rican, I am Mexican, but I LOVE pastelon! It’s my go to at boricua restaurants. Can’t wait to try to make it! Oh my!!!! This looks delicious but I would definitely have to substitute the meat for ground pork. I’ve got to try this. I FINALLY made this last night after having it pinned for almost a year! So delicious, and fun to make with friends! More Puerto Rican recipes please! I accidentally put 2Tbs of adobo instead of 2 tsp. Besides doubling the meat quantity, what can I do to save it? Should I just start from scratch? You could always throw in some diced potatoes in the meat mixture. Potatoes are famous for absorbing spice flavors in an emergency. You might need to cook the potatoes to soften. The smaller the cube, the faster they’ll cook. Hope this helps! Thank you so much for posting this recipe and pictures to go with it! One of my employees made this for a pot luck months ago and I’ve been dreaming about it ever since! Can not wait to make for my family! Delicious!!! I had a box of Goya frozen maduros in the freezer and used those.. this dish was TOO DIE FOR!! my guero husband about fell over he loved it so much. thanks for posting! yeah baby! pastelon is my favorite…doesn’t need anything else … maybe a salad, but boyoboy oboy is this good..my best seller! I followed the recipe step by step and it was absolutely delicious. I am also Dominican so this definitely made me feel at home! I just made it im taking it out of the Oven now!!!! This is sooooo tasty. My family loved every bit of it. I just finished making it for the second time. This is definitely a must try. (I, however, cook the ground beef much longer than recommended). excellent recipe. I am glad to see the current comments, which means people are currently looking for / trying new ideas. It also means the author has remained faithful (somewhat ~ last entry was March 2012) it’s easy to post and never respond to anything anyone writes, I am glas to see Meseidy has tried to keep up. Soooo, Meseidy, when are you getting your own foodnetwork show??? Made this for the family, incredible. Has a kick with hot sauce in the meat and using monterey jack slices on both layers. Sweet from the bananas and tangy from the goya Olives/Aalcaparrado. Great mix of flavors! Whole large tray was gone in two days, doubled the recipe. Used 10 bananas. 4 lbs ground beef. I deleted the raisins. Great recipe from a friend, Thanks Chrisitine T. for sharing!, You Rockkkkkk!!! Thanks for the recipe! My cousin put a picture up today of a pastelon and I found your website. My Madrina Luisa, who lived in Puerto Rico was going to show me how to make this recipe, but I never got the chance to visit her and she has since passed away many years ago. It brings back great memories and I love the pictures you have of the step by step directions! I made this several months ago for a friend’s birthday. It made her cry. I felt close to heaven eating this, I never knew what Pastelon was all these years, although I had heard of it. My mom says I did eat it growing up. But now I’m back for more, this piccadillo is incredible. Thank you again for your delicious recipies. But everyone-DOUBLE the recipe, so you don’t regret it later, trust me, for those of you who know what this is, if you’ve never made it before, stick to the recipe because some people don’t like that sweet plaintain taste, like more poor husband. I can double this recipe and eat it all myself, that’s how good it is. i made this tonight with two friends, and it was AMAZING. thank you so much for the great recipe! Mofongo con Sopa de Mariscos. I’ve also made the Bacalao (I substituted white potatoes for the cassava). I love your site – the pictures and recipes are easy to follow. So glad I found this recipe had a friend who use to make it she moved. I meet this guy at the laundromat every Friday evening, we always talk about this and that. He told me about Plantain Lasagne, I was like WOW!!!!!! Never heard of it…….So I looked it up, your recipe seems the easiest, tastiest, in general the BEST. I am gonna try it and let you know how it went. I stumbled onto this recipe post last week and finally made it tonight. WOW, I may never eat Italian lasagna again, this was wonderful. Added bonus it is gluten-free friendly so I am sending several friends to your recipe. This is high praise for me, I usually hate raisins, but loved everything about how this recipe turned out, and now I know what to do with plaintains! I made this for the first time and it came out delicious! Will definitely be a family favorite. My boyfriend is Puerto Rican, his Aunt is always telling me about this type of lasagna. Since his hours at work changed and now I am in charge of the cooking he prefers to eat Spanish food everynight I am learning alot about cooking with spanish flavor. I am Itailian and have made lasagna a million times this is not like any Lasagna I have ever made it is DELICIOUS!!! I, myself am Dominican and we make Pastelon as well. Just because you make it there doesn’t mean that it originated from Puerto Rico. Plenty of Spanish countries know and make Pastelon. I suggest you change the post. I just made this but meatless by using Morningstar Sausage Patties instead of ground beef. I also didn’t have Adobo so I added ground onion, ground garlic, paprika, salt, and pepper. So good!!! Thanks for such a great recipe. Oooohh i’m making this soon! I can’t wait! What is the fat, carbs, fiber and protein count? I just had these for the first time from my neighbor. OMG! Where have these been all my life? I can not wait to make these! Thank you for posting this. I’m looking for recipes that have no gluten, dairy, fermented, highly sugared, shellfish, or legume items (many food allergies). I think I can adjust this recipe to my needs. One problem is that I don’t think I will find adobo or sazon (actually I’ve never heard of these seasonings until I read your recipe) in any store in my hickish Tennessee town. Do you know of any substitutions I can make? As for sazon, I never use it. And I don’t use it for this recipe. Maybe someone can guide you on this? My food is tasty without it! I wanted to impress my mother with this. And I did!!! It was amazing! I could not find Msg free Sazon, so I skipped it. I didn’t use ripe enough plantains, so they were a bit firm. And the eggs didn’t soak in – it pooled into the sides. But this was my first attempt and I know what to do next time! Love your site – recipes are amazing!!! I have made this twice and it has been a big hit!!! And easy to make. Thank you! 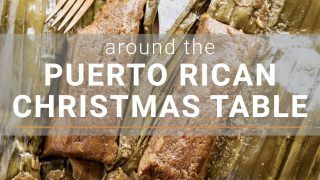 our neighbors in New Hampshire were from Puerto Rico and she used to make this recipe all the time, I loved it, now I have the recipe and will have to give it a try myself. We have lost touch over the last 25 years so if anyone knows Elam and Maria Ramos please pass this message onto them. Everything came out good except for the egg part.what is the purpose for putting the egg and milk on top of everything it just made my dish mushy. 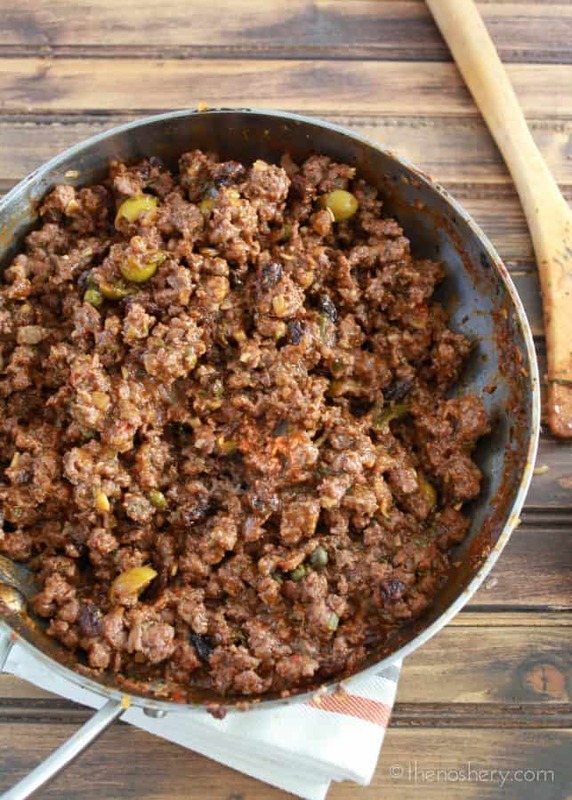 The meat filling is very much like Picadillo that I make. Is that how this dish originated? 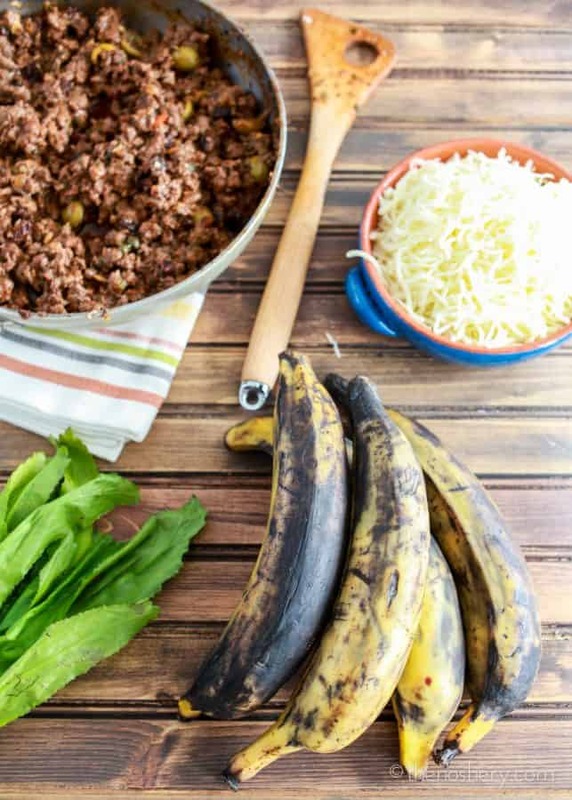 It seems the opposite of a traditional Picadillo recipe where I’ve seen a few sweet plantains placed under the Picadillo and then served with rice. btw.. Try using golden raisins instead of dark, mucho better! sp. thaught – blame it on the not-so smart phone. What an amazing treat finding this space! Not sure how I ended up here, really. Like you, I am from Puerto Rico (Manati) and currently living in El Paso, TX. Although I am a Microbiologist and mommy of one human and 2 canines, my life is filled with the passion for cooking and photography (also self-thought). Definitively enjoying your recipes and photos! Learned this recipe from a friend but like to follow your step by step instructions while cooking it. I have made this many times its always delicious and have never had this happen but tonight when I took it out of the oven the egg had scrambled in it, I’m really upset that this happened as I don’t like eggs, your recipe calls for 3 plus milk and have always been sceptical for this reason so I only put one and it scrambled! Any idea why this happened? My husband has been dying to make this or have me make it. As Italian as I am, and I love lasagna, I can’t wait to make this. It looks delicious.Can’t wait to try something new! We are making it for New Years Eve. Keep up the great work! Much success wished to you . I love this recipe!!! I was going to make pastelon tonight, but it looks like my platanos are not ripe enough yet…..
Maybe I’ll prep the meat first and make it all tomorrow…. Que bueno que tiene sus recetas aqui para que podemos aprender, y disfrutar la comida boriqua… !Mi mama sera muy orgullosa! Thank you very much…..I was looking for a great “Pastelon” recipe and now I have found it…My class mates will enjoy this very much. This recipe is beautiful. Just beautiful. Will try it. I absolutely loved using your cite for this recipe!! The was you lay it all out step by step WITH the pictures was awesome!!! This time of the year I always crave food from home and this was perfect!! Thanks!!! I am excited to try this recipe tonight. I’ve only made it once before using a, eh, verbal recipe. Came out fine but I think this one will be fit to share (although I doubt more than a square will survive my own plate). I love pasteleon. I don’t make it because my family likes the traditional..So I go to Bravo in my state of FL and they make it perfectly. What kind of cheese do you use? This is great because it is complex carbohydrates too and has lots of potassium. Hey, I loved this recipe! But, do you have to double layer it? Or could you just put one layer of it? Meaning, just putting the plantain, then the ground beef and chesse, then plantain and that’s it? Does it have to be doubled? Will it taste differently? yo soy mexicana pero queria agradecerte por tu receta, la hice tal como la pusiste y quedo deliciosa!!!!!!! I was craving puerto rican food. I’ve had pastelon at gatherings but never made it. I followed your recipe and it was easy and delicious! My latino friends loved it and even a couple of my gringo friends liked it. Thanks for sharing your recipe! Oh the way you describe this recipe is soooooo delicous my goodness I could taste it before I even try it. Great Job! I am gonna try this recipe next week! I have to get my ripe plantains!! I absolutely love this recipe! Thanks so much for posting this! And my friends loved it. I made this for my first time and it was amazing. I’m 33weeks prego and was craving it. It was easy and I plan to make it again p.s. I’m not even Spanish and it came out just like a Spanish dish. Wow, haven’t had Pastelon in years. We are from Panamá and we actually make it too. Exact same way but we call it “Pastelón de Tentación”. We also put Guandues (Gandules) in it. My friend is having a Puerto Rican party this weekend. I just might make it and surprise them! Thanks for your website! Thank you so much!!! I had this dish for first time last year when I vacationed in Culebra and they served it with some rice and maybe black beans, can’t remember, but anyway I do remember that it was Sssooo good and I always forget the name of it, nonetheless being able to find and order anywhere where I live. Now with your help from the recipe I can try to recreate that vacation memory at home. Thank you for this recipe! We used a mix of red & green peppers and added a serrano chili. We doubled it and put it into a deep lasagna pan and it was a good amount for 8 people! Served with a salad and some hot sauce to taste–it was a hit! im making just now lets see what my family said at dinner ! I love this dish, it is easy and looks and tastes like you spent all day in the kitchen, my people love this and when ever I make it they feel obligated to do theirs chores without being asked, they are totally under my control for days. My mother and grandma used to make this all the time before I left for college. Now I can finally make it for myself up here. It’s single handedly the best food ever. Mmmm your pictures look so yummy…I’ve tasted this only once from a very good friend of mine about ,9 years ago. I’ve lost contact with her so I couldn’t contact her to get the recipe and step by stet for the pastelon. I’m glad I found you on this site. I’m going to make this by the end of this week!!!!! I made this tonight for dinner. It was sooooo good. The perfect combo of sweet and salty. Definitely making it again. Five stars! Being also from PR this is one of my favorites. I made this yesterday and it came out delicious. My daughter-in-law had 2nd’s and I’m having some leftover now for lunch. I want to make it for functions and want to know how much more of each ingredient will I need? I made this tonight minus the raisins. It was fantastic! Thanks for the inspiration! im making this recipe on thurs cant wait to try it ive had it a fews times from my step mom who was PR gosh i wish she made it more. so im gonna try to make it for the first time myself and let her and everyone else on here know how i did wish me luck…….. THANK YOUUUU, i dont know who you are but thats the way to make it puertorican style..all ingredients from scratch!! I first had this dish on a trip to PR a few years ago and it stamped a place in my memory/stomach forever. I have found sazon in the grocery here in middle America (Indiana) but not packets so I am wondering how much is in one packet? probably like two and a half regular spoonfuls is in a pack. I had to take some liberties with your recipe, but since it worked out well, I wanted to share. I had several pounds of over-cooked pork loin on my hands, and I made the Pastelon recipe to use some of it up. I made the vegetable mixture as per the recipe, but I did not include the chopped meat. When the veggies were cooked down, I added one pound of the over-cooked pork (Chopped very fine), and a some beef stock since the pork was so dry and I need to compensate for the juice that the chopped meat would have added. The rest of the recipe was executed as you wrote it in terms of the plantains and the layering, and the dish turned out wonderfully. The dry pork was moistened by the other ingredients, and being chopped finely, its over-cooked texture was unnoticeable. Thank you so much for the recipe. I look forward to trying it again, but this time the right way with fresh chopped meat. Can’t wait to try out my Veganized version!! Thanks for the recipe. This has got to be one of the best things I ever ate! I tried this dish at a party I attended in Bayamon, Puerto Rico and I must say It has haunted me ever since. I am going to make this for my New Years eve party I know it will be a big hit. I’ve made this recipe once before and it was a hit especially with my husband who is a gringo. I wanted to make it again but couldn’t find the recipe in my pile of recipes. I googled it and was thrilled to find it and your blog . I’m very visual so was excited to see the visual step by step guide you have. LOVE IT!!! I am compiling all our family favorites in a family cookbook and this one will definitely be included! I absolutely LOVE this recipe! I made it for Thanksgiving and EVERYONE LOVED IT! I’m adding this one to the family cookbook. THANK YOU so much for this recipe. I am PR and married to a gringo who LOVES PR food. I grew up eating PR food but was never taught how to make the dishes so I have been scouring the net to find some yummy ones to try. Now, I have never had or heard of pastelon but ever since I saw it on Triple D, I have been curious to try this out. Can’t wait to try this recipe! I will be sure to report back our reviews. Thanks for helping this poor little PR girly out! jUst wondering, IF I want to make this for about 10 people, each of course gettting healthy portions, how much of the ingrediatns should I add. At least, how many plantains should I use? Do u need to put eggs before the 1st layer of plantains? & if u do several layers do u need to pour eggs at every layer? You just pour the eggs over top when your done assembling. I really want to try this recipe out.. I was just wondering if it would be all right to pour the egg mixture over the first layer of plantains too?…of all the recipes online I found this one is the easiest to follow! mmmm. it’s in the oven now. Can’t wait! My Fresh Air daughter Arelis in Puerto Rico sent this recipe to me as I was hearing how delicious it is. I am very excited to make it and remember our wonderful visit with her and her family last January!! Thank you very much Meseidy…I’m from Panama but my in-laws are from Puerto Rico so my husband really misses his hometown meals…I will try to do this recipe this week since I have the plantains at home already (thinking about doing some tajadas)…Thanks again! sounds yummy i am doing it for my family and boyfriend but im wondering why you put the batter of eggs and milk? It’s helps keep everything together. I had this dish while visiting PR a few years ago…. it was the most delicious thing I ever ate! I’d forgotten the name of the dish and I was telling a friend about it and decided to just google “sweet plaintain lasagna”……. and I found your site…..Hallelujah! off to make Pastelon and make my taste buds dance!!!! I have my plaintains ripening in a plastic bag on top of the fridge as I type can’t wait to make it. > I couldn’t find Sazon at the supermarket, so I seasoned the beef with cumin, paprika, oregano, garlic powder, onion powder, ancho chile powder, cayenne pepper powder, red pepper flakes, salt, and black pepper. I imagine it tasted a bit different (that’s roughly my impression of ‘taco seasoning’ — I’m keeping my eyes open for Sazon for the future!) but at least we know that the goodness of this recipe isn’t sensitive to the exact seasoning prescribed for the meat. > I used something like a pound and a half of cheese (panela, oaxaca, and queso fresco) — I wasn’t really paying attention while I was shredding, and next thing I knew the food processor was FULL. Had to use it all! And I was glad I did — it was soooo wonderful. > Instead of baking at 350, I baked for a little while at 300 to start to get the cheese melty, and then used the broiler to get a nice crust on top. Anyway, hopefully those notes are helpful to someone, even if only to prove that you really can’t screw this thing up. Thanks so much for posting! I just made this for dinner……..YUM!!! I am in heaven…..right…..now. Thank you so much for this recipe and the amazing pictures. I am Puerto Rican, but currently living in Naples,Italy. Although the food here is amazing, I am craving a dish from back home. I will be making the pastellon as soon as my plantain are ripe. Thanks again, and wish me luck!! Would this be good to make ahead of time and bake several days later? YAY!!! I am just waiting on the plaintains to ripen. So ready to try this. Hey I tried it out makig it a few days in advance and then cooking, it works great, but be sure to hold off topping it with the egg mixture until right before cooking! All I can say is YUMMO!! I loved how they submitted this recipe. How much easier can it get! Great job and great Puerto Rican Lasagna! Me alegro que hayas puesto la receta de pastelón. Yo he estado buscando esta receta por un largo tiempo. Ahora voy a poder hacerlo. Gracias un monton!!!! I TRIED THIS DISH,BUT IN PLACE OF CHEESE I USED GREEN BEANS.IT WAS SLAMMING.ESTABA POR LA MACETA.SONRISA POR FAVOR. I TRIED THIS DELICIOUS DISH BUT IN PLACE OF CHEESE I USED GREEN BEANS.SLAMMING DISH , ESTA POR LA MACETA.SONRISA. Mama, boricua here! I heard someone say ‘Puerto Rican lasagna’ and I was both suspicious and curious. But I read this and I can tell, you got it right. 😉 Sazon? Adobo? Plaintains? ^0^ The disclaimer that this WILL make you fat, dumb and happy? 😉 You got it right, mami! Thanks for sharing this recipe! I can’t wait to try it myself! this recipe is absolutely WONDERFUL!!! i’m a vegetarian but a latina none the less. i intend to make this for them as soon as possible. Great job explaining the recipe. The pictures are fabulous!! My children love this pastelon so much. I love it too. This is Puerto Rico cuisine. Deliciosa!! I’m from San Sebastian del Pepino living in Venice, Fl. Made this last weekend and it was the bomb! I used mozarella cheese and added a little melted butter on top before baking. It was delicious! Thank you. I have serious problem cutting the plaintain in strips… they always end up a huge mess and the pastelón [although tastes awesome thanks to the recipe] doesn’t as look as good. I wouldn’t dare bring it someplace… Any tips?? I lay the plantain curve side down and push down to almost make it straight to cut but if your having a hard time doing long strips, cut the plantain in half and do shorter strips. Another tip, which I just thought of but haven’t tried before it to peel only half the plantain and cut the flesh while still in the skin (similar to how an avocodo is done) this may hold it together and make it less slippery to handle. When done cutting then remove the remaining skin. I placed mine in the freezer for 5 minutes or so just to firm them up a bit. It worked for me. I JUST MADE SOME PASTELON AND IT WAS GREAT THANKS FOR THE PICTURES! I WANTED TO KNOW IF YOU HAD MORE RECIPES. Thanks for posting this wonderful recipe. I made it for dinner today and both my husband and i loved it. I have been craving this dish for a while now but was afraid that it would be too difficult to execute. Your recipe was surprisingly easy considering the delicious outcome. Sampled this dish at my kids’ International Days festival this past week and it was incredible!! I had to find the recipe and your posting is exquisite! I bought everything over the weekend and am making it tonight. (I think her’s had cashews in it as well though).Either way I can not wait! I’ll keep you posted on the critics in my house and their response. I’m really hoping they don’t like it so as there will be more for me!! Any suggestions for a side, besides the obvious salad and bread? Thanks! for fiesta. White rice, avacodo, salad….heaven! Thank you for putting this up with photos! Great recipe! I love how fresh everything smelled when I mixed the seasonings with the meat. I keep not using raisins and bay leaves because I never have them on hand, but I will make it a point to add them next time. I have eaten some pastelon in a Puerto Rico restaurant while I was staying in Seattle. Now that I’m back in France, I have to try it, it’s so tasty !!! thanks for the recipe and the pictures, it’s well presented. Delicious! Thank you for the recipe!!!! Hey I just made this!!!!!! It’s in the oven right now!!!! We really enjoyed your recipe; it was yummy yummy although a lot of work. But well worth it. And we will surely make it again (only those calories……..). We are planning to leave the adobe out next time and put maybe more oregano in it to make it even more outstanding, or combine it with other fresh herbs. Great site, with lots of good recipes, love the combination with the photography and also your great sense of humor. Keep it going! Thank you so much for this recipe! De todas las recetas que encontre online esta es la mejor explicada y la que mas me recuerda a como mi abuelita la solia hacer. How funny that like me you also live in Tulsa. Yo me mude al area recientemente and do not know much about places to shop. Your blog is a lifesaver for me! I so wanted to thank you for posting this! I am not Puerto Rican (I’m Jamaican and my husband is a gringo lol) but my best friend is Puerto Rican and through high school and college we ate at each others houses on the regular. Her mother made Pastelon for the rehersal dinner for her wedding…that was the first time I ever had it (of course because this was a huge meal there was Pernil and a miriade of other tastey goodies). Anyway I have not had Pastelon since then and my best friend lives a good 4 hours from me so our meals together a limited (we live in Florida by the way). I’m going to attempt to make this over the weekend, but I wanted to thank you again in this wordy message for bringing back happy memories…isn’t it great how food does that?!?!?! I will be a devotee to the Noshery from now on!! Thanks so much for posting this recipe. I’m half puerto rican and trying to learn how to cook spanish food. The step byt step pictures were a big help. It was delicous! I used yellow peppers since my husband doesn’t like then green peppers. I had some trouble cutting the plantains long ways so I ended up just slicing them like banana chips. Still turned out yummy! Can’t wait for leftovers. What is pastelon usually served with? I always serve it with rice. Either a yellow saffron rice, or rice and beans or rice and piegeon peas. Search “arroz con gandules” or a rice and piegeon pea recipe or if you want white rice and beans serch “habichuelas guisadas” for a bean recipe. Hi Meseidy! I was looking for a calorie count for Pastelon when I came across your site. So nice to know there is another Puerto Rican living in Tulsa, OK! My Mama is visiting from PR right now and just took TWO pastelones out of the oven with plantains she brought over here from the island! I’ve already scarfed down a piece. Thanks so much for this! My dad is from Puerto Rico, so I love making these sorts of dishes. I did a quick search for a recipe and your site came up– bookmarked you! Thanks again. what kind of cheese was used in this Puerto Rican lasagna? In the post I used monterey jack but you an also use swiss. This recipe is wonderful and the photos are fantastic! I know my Boricua friends would roll their eyes at my adaptation, but sometimes in the fall I make this recipe and substitute roasted squash for the amarillos. It isn’t the “right” way to do it, but when squash is in season and I need a slightly lower fat version, it is delightful! Searching the web I found your website.. let me say this is the best recipe website to date.. step by step is what I need and the pictures are a great help. I made a Pastelon last night and IT WAS GREAT. Family loved loved.. Thank you.. Going home to make Garden Pork chops YAY! OMG, thank you for posting this recipe!! I’d also seen it on the Food Network and had been craving it for about a month now. I made it today after finally finding adobe and sazon after scouring most of L.A. (I came this close to having my mom in Jersey mail me some). I substituted ground turkey and soy cheese since I don’t eat dairy or red meat. I also used a red pepper instead of green. And mashed the plantains which I bought pre-cooked at a nearby Cuban restaurant and made one layer. It was soooooo good. I’ve already had two servings. And wanted to post a comment to say thanks!! And to distract myself from having a third piece. We’re you able to find it Lisa g.? So, I thought I would share that I just biked 4 miles in the rain to get the ingredients to make this dish again. It is THAT good. I was introduced to plaintains last year at a fiesta. I got to try them and they were so good. I saw your recipe and I had to try it. It was excellent thanks for sharing this wonderful dish. Made this lasagna tonight…it was fabulous!! Loved your recipe!! I saw this made on a food network show and have been wanting to recreate it ever since. My hubby and I loved it…and your recipe was so easy to follow, especially with the pictures. Thanks!! This recipe is simply awesome. I first learned of it of on an episode of “Diners, Drive-ins and Dives” on the Food Network. I am not really a fan of beef, but the plantains added a nice sweet balance to the dish. I had to stop myself after a second serving. I am fan of anything Italian, and trust me when I say that this P.R. dish is as tasty as the best Italian lasagna. I’ve tried this 3 times now including for a recent & party everyone liked it. I love plantains, a staple in Jamaica so this was a great way to combine it with something else other than a side treat. Yummm! I just learned this from someone at my job and we use a slight variation to it. We use Sofrito (which combines green peppers, onions, cilantro, garilc, in olive oil) and instead of slicing the plantains, we mash them with a little butter, then layer it. The taste is the same and it is the most wonderful dish I have made! do you cook the plantain at all before you mash it with butter? or do you just slice it, mash it with butter and do the layering? I’m making this tonight for my company’s office party. I am Dominican and I also love to make this dish. I like to boil the plantains then I pat dry to remove excess water and I make a traditional mangoo (Mashed Plantains) with butter and my preference a chopped hard boiled egg then I spread evenly in layers. I also love mozzarella cheese. Everything else is the same as the recipe. I love this dish I hope you and your family enjoy! Do you put anything on the plaintains when you fry them??? I saw this dish on the food network a few days ago and it looks delicious! I absolutely love Latin food and have been searching for a good recipe. I really appreciate your pictures! No, the plantains are just sliced and fried in the vegtable oil. The trick is to use plantains that are nice and ripe, like the ones in the picture. This is one of my favorite dishes. If you make it come back and tell me how it went. 😀 I am sure you will love it. This was FABULOUS! I’m glad I bought extra plantains – my kids were eating them up as fast as I could cook them! The last batch I put brown sugar and cinnamon on them and they put them over vanilla ice cream after dinner. And speaking of the dinner…my family loved this as well – there were barely any leftovers! It was delicious! Thank you so much! i always like to overcook (slightly burn) when I cook ripe plantains with cinnamon…and love it with icecream-to me it tastes like apple pie! Que rico Meseidy! Voy a preparar esta receta esta noche para mi esposo. Gracias por todas tus recetas. Todas las que he hecho hasta ahora han sido fabulosas. Meseidy – I’m going to a fantastic restaurant in the Baltimore area called Restaurant Sabor. The talented chef is also from Puerto Rico. According to the menu on the restaurant website, today’s special is Pastelón. I googled to see what that was, and your Noshery blog popped up (GREAT blog name, by the way!) I just love the photos and description you provided. Thanks to you I’m going to order Pastelón tonight and I can’t wait! So how was it? Isn’t it the best? Loved this version of your pastelon. My Mami used to make it with velveeta. Equally as yummy. Will be trying your’s soon. See my comments to your cousin Carlos Yanes. I made it. Last night. Fantastic! I’m thrilled that you published this recipe. I saw this dish featured on “Diners, Drive-Ins and Dives” (Food Network) the other day and wanted to make it. Thanks much! You watched Triple D’s episode on SOL FOOD — the Puerto Rican restaurant where I live!!!! This is one of their specials — so good! Wow…Tulsa, OK is very different than P.R. or FL. Glad to see you’re trying to preserve your roots with this pastelon and some of your other posts. Saw this and had to say YES! This sounds awesome. You’d make a little Duo very happy by serving this. I used 2 cups of cheese. It only had 2 layers of cheese so I used about 1 cup on each layer. I reserve just a bit to sprinkle on top when I was all done. Have fun! I hope you enjoy it! Wow, that looks delicious. Mami always puts a layer of green beans :(. I always request that the green beans be left out of 1/2 of it for me :). I thought this dish was called pinon. I think you mean piononos. It is pretty much the same except pinons are individual size. You make a beef patty and wrap the plantain around it. Same flavors just different package. This post is from a couple of years ago but I felt the need of making a clarification. In Puerto Rico this dish is known both as piñón and pastelón, it all depends from what part of the island(s) you are. When someone from the south says pastelón they are not referring to this dish, that they called piñón, but to a potato dish known in English as shepherd’s pie. I’m from the north so I called the one with plantains pastelón and the potato one pastelón de papa. The same thing happens with a lot of names and phrases all through Puerto Rico. The version of this recipe with the green beans in it is called piñon. Pastelon is this one. You are correct. It is called piñón regardless of whether it contains green beans or not. I’m sure I could live on this lasagna. Other than water this would be all I needed! Oh my gosh! How didn’t I find this sooner?! This would TOTALLY be worth the extra cellulite!!! I’m going to try this for sure. I love fried plantains, they are a staple of my homeland’s cuisine as well. Whoa, what an interesting recipe! I’ve never heard of anything like this before. I’m definitely saving this one! WOW! Thank you for posting this recipe. When I was little my aunt used to call me ” Mister Tajada”. Tajadas are what we call slices of ripe plantains in Manizales, Colombia. This looks really interesting. The plantains might be a little too sweet for me – I’m really not into a lot of sweetness – but I bet my husband would be all over this. Place n paper bad on the oven or cupboard overnight an he plantains will ripen. Your dishes and pics are great! I am from Puerto Rico, but must say, I have never made Pastelon…but my mom has. It is delicious! Now its my turn to try. I also like your section on ‘Photography’. I like your web site your pics and food they look great ! I enjoy cooking some of this recipes . I love, love, love pastelon. You’re step by step recipe will make it easier for me to try making this wonderful meal. I love this. I’ve been thinking about doing a cuban lasagna, now I’m inspired!